Disappointingly few of the debutant artists issuing from LA’s overweening graduate schools are able to make the leap from work pandering secondhand professorial nostalgia to an authentic mature creative voice that mirrors something other than whatever everyone at school is talking about. This is indeed why so many of them fall into stultifying repetition when they realize nobody in the real world actually cares. Frances Stark’s flat retro-concrete poesy always irritated me with its po-faced insistence that it bore some News, and I entered this show hoping for something I could write a mean review of, as my bile has been getting a little backed up lately. Imagine my consternation when I saw that ‘In Other Places Light’s Pitched Happy Tents’, Stark’s solo show chosen as Marc Foxx’s Pentad prolegomenon, had bridged the gap, delivering not only something to think about, but, most sweetly, something to look at as well. 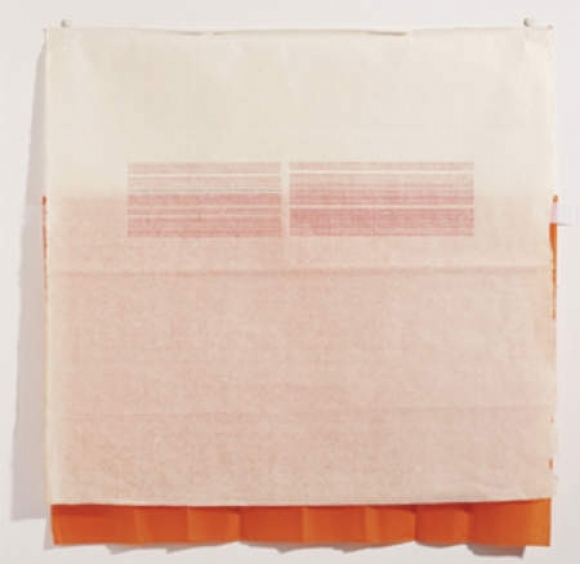 As in earlier work, Stark traces out blocks of text using a variety of carbon papers. Here, her palette has expanded considerably to include both vivid and improbable stock colors as well as subtle pigments of her own concoction. Most of the text is snippets from sad but verbose late German romantics Robert Musil and Thomas Mann spelled out vertically again and again, resulting in horizontal bands of colorful and not immediately decipherable copy. The words are slight and fragmentary, visual and spatial in nuance, evoking a melancholic stasis. The horizontality and color choices of the blocks of letters also reference landscape, and the identification of typography with topography recalls both Greg Curnoe’s rubber-stamp-on-canvas ‘landscapes’ of the mid 60’s and more recent allegorical speculations about cyberspace. But we are thankfully left to our own devices for the exegesis. ( and which few works of any era can pull off convincingly) is here replaced with a less pubescent self-assurance; less anorexic and more bulimic . In one piece, Stark quotes Donovan paraphrasing an old Zen description of enlightenment: 'First there is a mountain, then there is no mountain, then there is.' It seems to me that the milieu from which Stark's work emerged believes that the way through the mountain is to systematically chip away at it, deny it until it is a present absence, a vessel ready to be filled by a more rigorous mountain. But the vanity of such abstinence was clear to the Buddha long before he ever sat down and shut up. While not exactly ‘the path of excess leads to the palace of wisdom’, the subtext of Stark’s new work at least indicates a will to grapple with the mountain rather than trying to wish it out of existence. It would be interesting to see what she might produce if she were to throw caution to the wind and wallow in the mud a little. But Stark’s work has always brought to mind medieval copyists, with connotations of monastic detachment and philosophical illumination, if not of decorative extravagance. Before this show, this association always privileged a 20th century intellectual tradition tainted by academic arrogance, a tradition that considers itself the torch-carrier of the Enlightenment and acts as if it was the first to discover the limitations of language. To cling to these credentials means constantly trumpeting them by limiting the use of verbal language to acceptably self-humiliating levels and implying the reassurance that the flaw is in the word, not the man. Such frills smack more of the redundant narcissistic filigree than the goofiest 7th generation Day-Glo action painting. It is precisely this unwitting confusion between substance and style, equating hermeticism with willful obscurity at the expense of content - a patently aesthetic decision that would make Duchamp puke - that Stark’s drawings have finally overcome -to the detriment of my spleen but the benefit of all who can appreciate a luminous, language based art that doesn't explain itself to death.